By Jay Rogers. Posted May 03, 2013. ORLANDO, Florida (forerunner.com) – In 2013, the mainstream media is facing a conundrum – whether to report on the gruesome practices of Philadelphia “House of Horrors” abortionist Kermit Gosnell – or to gloss over an important legal case on the basis of this being an “outlier” story. This false dilemma is disingenuous at best. Since when has the mainstream media shied away from gruesome murder stories involving controversial figures? In fact, the real reason that the liberal media won’t touch this story with a ten-foot pole is that Gosnell’s practices are a lot more mainstream than abortion rights advocates are willing to admit. Gosnell is being tried on multiple murder charges stemming from cases of babies born alive and then killed by having their necks snipped with scissors. He also faces a third degree murder charge in the case of a woman who was the victim of a badly botched abortion and dozens of charges related to trafficking in prescriptions for narcotic drugs. James Pendergraft has been involved with some type of legal trouble in every year since he arrived in Florida in 1996. 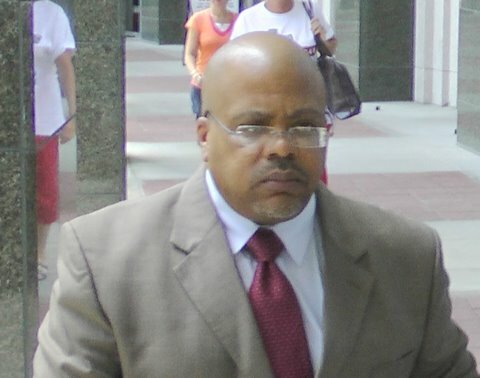 Frequent news stories chronicle the sordid tale of babies born alive and left to die, five suspensions of his medical license, a conviction for extortion that led to time in federal prison, and several lawsuits including a $36.7 million judgment due to a botched abortion in which a baby girl was born alive and survived with massive injuries. James Pendergraft’s criminal activities are so legion that he has generated hundreds of news stories in the local press since he first arrived in Orlando in 1995. Pendergraft is an abortion “doctor” who runs a chain of five late-term killing centers in Ocala, Tampa, Fort Lauderdale and two in Orlando. Pendergraft has had his license suspended five times for doing illegal late term abortions and for allowing a staff member with a history of drug dependency to write prescriptions for herself and others. Allowing someone who has a history of being addicted to prescribed drugs to freely write prescriptions is highly irresponsible, but Pendergraft is being accused of more irregularities. In 2011, a former staff member of Orlando Women’s Center told a pro-life sidewalk counselor that Pendergraft transports huge bottles of pills in his vehicle. A staff of killers carried on doing late term abortions at his direction while Pendergraft served his suspensions. These included three abortionists who died of untimely hearts attacks, two who have been convicted of drug trafficking and several more who have left a trail of injured women and botched abortions resulting in frequent lawsuits. The weight of this butcher’s own sin is beginning to crush him. On the other hand, it is a great travesty that the state of Florida did not prosecute this man criminally many years ago. Due to the politically charged nature of the abortion controversy, the district attorney and the state attorney general have left the regulation of Pendergraft’s abortion mills to the Agency for Health Care Administration (AHCA) and the five suspensions of his license to the Department of Health (DOH). Neither state bureaucracy has authority to begin criminal proceedings. In addition to Pendergraft, I include here as “exhibits” four more abortionists who have worked in Orlando at Pendergraft’s abortion mills and a fifth Miami abortionist, Pierre Renelique, whose story is so bizarre and macabre that it defies belief. Randall Whitney is a 79-year-old circuit rider abortionist for James Pendergraft’s Women’s Center mills in Orlando and Ocala specializing in second trimester abortions. His medical license is currently being reviewed by the Florida Board of Medicine in 2010 with regard to a case in which he was charged with battery for slapping a woman on a table while he was injecting her with valium prior to an abortion procedure. Whitney has had a tumultuous history in central Florida. He began doing abortions full-time in the 1980s when his medical license was suspended after a malpractice incident. In the mid-1990s, Randall Whitney tried to open a second abortion clinic in Melbourne in competition with Aware Woman Center for Choice. When pro-lifers discovered this, they leafleted the five-story river-front office building where Whitney had signed a lease telling all the tenants that Whitney was an abortionist. Discovering that Whitney had lied about the nature of his business, and being very pro-life themselves, the building owners canceled his lease. All of Aware Woman’s volunteer “escorts” quit when they discovered that Patricia Windle’s motivation was to curtail a rival abortion clinic — not to “help women” as she often claimed. After all, wouldn’t two abortion clinics “help women” twice as much as one? The volunteer escorts thought so, but Patricia Windle knew it would just hurt her profits. Her actions show her priorities – profits first, “helping women” second. After 15 years of going to Melbourne twice a week to kill unborn children, Randall Whitney was forced out. Then in September 2006, Whitney closed down his own clinic, Family Planning Center, in Daytona Beach, rather than comply with state regulators. He became a circuit rider abortionist working for James Pendergraft. Whitney testified to the Florida Department of Health and during a civil lawsuit hearing that babies are sometimes born alive and left to die in James Pendergraft’s abortion clinics where he works. In 2001, a patient of Whitney’s delivered a child who lived with massive birth defects after a botched abortion in Orlando. As a result, James Pendergraft and Orlando Women’s Center was hit with a $36.7 million judgment. Whitney is also the subject of two malpractice lawsuits that are ongoing. Whitney served another suspension in the 1980s for a malpractice incident. After that time, he began doing abortions more or less full-time. Perper is arrested at the “pill mill” he ran at Delray Pain Management. Harry Perper is currently under indictment on multiple counts of conspiracy and drug trafficking, facing up to 490 years in prison. He most recently worked as a dealer of pain pills for a controversial clinic in Miami that was founded by a convicted drug smuggler. Perper was the abortionist on duty at EPOC abortion center in Orlando when Baby Rowan was born alive and left to die. Baby Rowan’s mother, described him as a very fast-moving, hyperactive type of person. Perper perforated a woman’s uterus at Orlando Woman’s Center requiring a hysterectomy for which he was subject to disciplinary action. Amazingly, his medical license was not suspended due to an agreement in which he satisfied the terms of disciplinary action. He is currently clear to practice medicine in the state of Florida. Above left: Whaley arrives to work at Orlando Women’s Center (photo credit: Deanna Waller). Above right: Walker Whaley in the 1980s. Walker Whaley was convicted for conspiracy to manufacture cocaine in his basement with his brother Jonathan in 1986: (United States of America, Plaintiff-appellee, v. Walker L. Whaley, Defendant-appellant). Whaley also was disciplined in a case in which an infant was born alive. He attended the birth of Chad Nolan on December 14, 1981. He allowed fetal distress and tachycardia to continue for three hours, administered narcotic drugs, which crossed the placenta to the unborn child, and failed to perform a C-section, resulting in the infant suffering a seizure disorder (DPR Case #0035663; Duval County Circuit Court Case #84-10676; and Florida Times-Union, February 9, 1986). Whaley died on May 31, 2012, at the age of 64 of a heart attack. 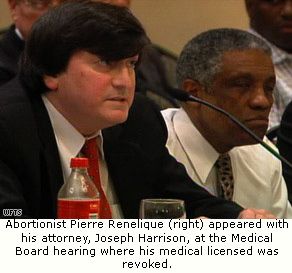 Miami abortionist Pierre Renelique was found guilty in February 2009 of medical malpractice, after he failed to show up for a late-term abortion in July 2006. The mother went into labor (because of drugs given to her by Renelique the day before) and unlicensed staff delivered a live baby girl, according to news reports. The baby was stuffed into a plastic bag and left to die. Police found her body a week later. Renelique moved to New York City later that year, and began working at Clinton Place Medical Center, at 8 Clinton Place, in the Bronx, just west of Jerome Avenue. Outlier or Mainstream Media Cover-up? Florida has roughly 7 percent of the U.S. population (over 20 million people) and 10 percent of the nation’s abortion clinics (66 state-licensed locations of approximately 660 clinics nationwide). AHCA inspects Florida abortion clinics at least once a year and several times for clinics that have a history of violations. If we consider that many states have even more lax restrictions than Florida, then it is not unlikely that there exist dozens of more “killers” whose abortion mills fit the “House of Horrors” syndrome.